Six Sides Triangle,Crisscross side to side, Adjustable Bed Sheet Fasteners at the corners. 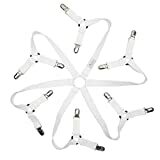 Easily attach - Attach this suspender to your bed sheet using the clamps. 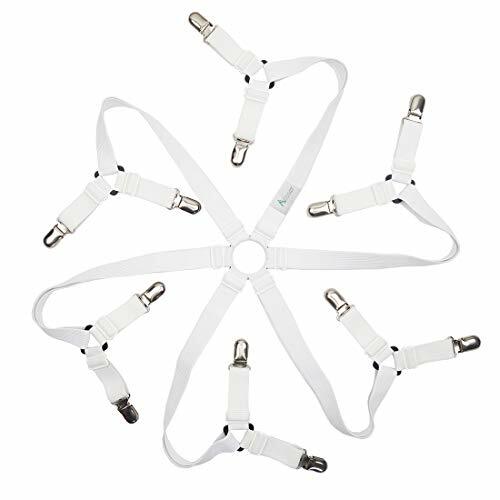 Durability - Made of sturdy chrome metal clips and heavy duty wide elastic bands. Protection - Built-in plastic clenching system does not harm fabric. Professional adjustable design to fit for any kind of bed sheets both King Size, Queen Size, Hospital Beds, Inflatable Beds, Adjustable Beds, Waterbeds, Futons, RVs, and Hide-a Beds.